Turn your tap water into Delicious Drinking Water. The series AUS492T is the ideal solution by offering the best of performance, convenience and quality. Mechanically filters while providing the safest water possible - Ceramic elements may be cleaned 100 or more times with a soft brush or 3M 'Scotchbrite' This filter protects and extends the life of the carbon filter. Removes greater than 98% of particles less than .2 micron. See the fact sheet on this amazing quality cartridge. The work horse is a special high grade carbon cartridge which has excellent adsorption qualities specially designed to remove chemicals: Chlorine, chloroform, ammonia, pesticides, herbicides, lead, copper, arsenic, mercury as well as parasites – giardia and cryptosporidium (Sydney's drinking water problem) see cartridge report for more detail results of this amazing AC490 cartridge. The quality of our drinking water is a growing public concern. Every day there are reports of water supplies contaminated by industrial and agricultural pollution. The Environmental Protection Agency has stated: "We can no longer take the purity of our drinking water for granted." In addition to those concerned about safety, millions more are dissatisfied with the poor taste of their drinking water. The series ACT491 is the ideal solution to these concerns by offering the best of performance, convenience and quality. Imagine being able to filter every drop of water that comes into your home. No matter which tap you turn on, you're guaranteed to have fresh, pure water. As soon as you install our Whole of House Filter System , you'll notice the difference. Your water will taste fresher than it ever has before, with no nasty lingering odours. Your shower and baths will leave you feeling clean and revitalised. Of course, you'll no longer have to worry about your clothes becoming discoloured in the wash.
Best of all, your home appliances will last longer. Imagine the benefits of removing harsh corrosives from your hot water systems, electric kettles and irons. Incorporates x 2 (20" x 4½") white housings with pleated washable sediment and carbon block or granular carbon cartridges. Various micron sizes are available, from 1 to 50 microns. Installed on mains plumbing, sediment and chlorine are removed from all taps and showers throughout the house, at up to 20 litres per minute, protecting tap washers, hot water systems and appliances. Download Brochure Plus our Whole of House Filter System comes with a full 5 Year Warranty. Don't put up with substandard water in your home. Telephone Aqua One right now, and you can improve the quality of your family's water... forever! This semi automatic whole of house system is a pressure filter containing approximately 20 litres of carbon. This granular carbon filters system will effectively reduce or remove; chlorine, ammonia, pesticides, herbicides, chloroform, algae, rust, dirt, taste, odour and will remove other organic contaminants from a filtered water supply. These dissolved organic can cause taste, odour and colour problems. This pressure filter, simply comprising of a vessel containing a bed of filter medium through which water is passed. The filter medium has the ability to remove some iron, chloride, taste and odour. Water passes though a filter bed and it becomes congested with filtered particles, which in turn causes the pressure drop across the bed to rise. The bed's filtering ability is restored by periodic back wash programme cycles which flush the accumulated particles to drain. Installed on mains plumbing, sediment and chlorine are removed from all taps and showers throughout the house, at up to 45 litres per minute, protecting tap washers, hot water systems and appliances. The semi-automatic backwash valve extends the life of the granular activated carbon media by enabling it to be back-washed and cleaned. All sediment and sludge is flushed to waste, either into the garden or storm water drain. This is accomplished simply by turning a knob, allowing the mechanical clockwork operation to back-wash, stopping automatically at the end of the short cycle. Using this method the carbon media will last the average household three to four years, depending on water quality and usage. Steam Distillers provide you with pure best drinking water - close to 100% purity - no matter what the water supply. The Steam Distiller takes between 5 and 6 hours to turn ANY water into 4 litres of drinking water, at its pure best. Steam rises from the surface of the boiling water leaving behind heavy metals, dissolved solids and other impurities, killing any bacteria, viruses, Cryptosporidium and Gardia. These remain in the boiling chamber as a residue which is easily removed by the cleaning crystals supplied with your Steam Distiller. The steam rises to the top of the boiling chamber, entering the fan-cooled stainless steel cooling duct. This turns the steam back into water. Although this water is now classified as pure, your Steam Distiller includes a post-filtration filter (good for one month) as a final precaution to remove any residues of organic chemicals. The filter is needed to remove the final residue of chemicals such as chlorine which rises with the steam. Effectively Removes: Aluminium, Arsenic, Bacteria, Cadium, Chlorine, Cryptosporidium, Fluroide, Giardia, Lead, Pesticides & Herbicides, Phosphates and Sodium. Makes 4 litres in 5-6 hours (at only a few cents per hour). Includes: One high grade polycarbonate collection bottle/ 6 x Carbon sachets/ Cleaner. Easy to maintain, easy to use and attractive to have in your house or office. Simply add tap water to the top half of the ceramic stand, and wait for it to drip through the Doulton ceramic filter candle, providing the great tasting, pure water collected in the bottom half. · The outer micro-porous ceramic wall screens the water down to one micron to remove up to 99.8% of bacteria and suspended solids such as aluminium, lead, copper, iron, manganese, chloroform, chlordane (q & a) dieldrine, heptachlor, lindane, bromoform, trichloroethane, dibromochloromethane and dichloro bromo-methane. · The water passes through the inner core of activated charcoal which remove chlorine, ammonia and bad tastes and odours. · A small (and necessary) amount of dissolved minerals and active biocide is left in the water to prevent any possible contamination. While Reverse Osmosis is best way of removing fluoride from your drinking water, you can also use a 3 stage undersink or water filter to remove greater than 90% of flouride from your drinking water. 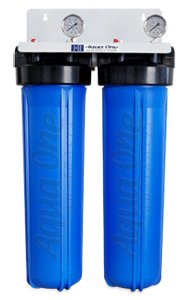 State of the art technology in water purification, the QRO4 Quick Change Reverse Osmosis System offers a compact design, with easy maintenance and hygienic twist-off filtration cartridges. Of all the methods to purify drinking water for domestic use, the process of reverse osmosis is the most advanced, economical and effective. With a Reverse Osmosis Filter you can rest assured that your drinking water is the best quality water possible. Of all the methods to purify drinking water, Reverse Osmosis is the most advanced, economical and effective. Reverse Osmosis has the ability to remove chlorine, inorganic chemicals, pesticides, heavy metals, flouride, dissolved solids and impurities in the water. 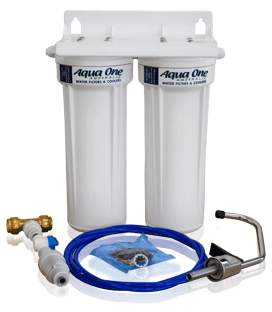 Aqua One has Reverse Osmosis filters in counter top units or they can be installed undersink. It is the best you can get in water purification. Of all methods that purify drinking water for domestic use, the process of REVERSE OSMOSIS is the most advanced, economical and effective. REVERSE OSMOSIS has the ability, unlike filters, to remove contaminants such as dissolved solids and all other impurities. The REVERSE OSMOSIS (RO) process works by forcing water under pressure through a special TFC Membrane. The membrane has the astounding quality of attracting water molecules and repelling dissolved impurities, even those smaller than the water molecules themselves. 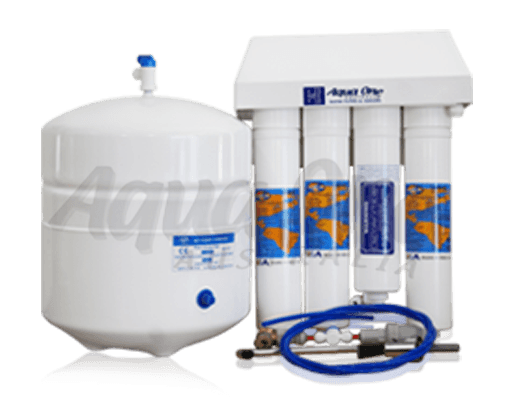 The REVERSE OSMOSIS (RO) purifiers remove all the contaminants of concern to the consumer such as bacteria, viruses, parasites, heavy metals, inorganic chemicals, pesticides and algae. RO purifiers flush the impurities down the drain rather than collecting them in the filters, as is the case with ordinary systems, preventing any build up within the system. Also RO systems oxygenate the water so it has a lively fresh taste, unlike distilled water, which has a flat dead taste. With REVERSE OSMOSIS, you can be rest assured your drinking water is of the highest quality possible and the best possible investment for your families' health. Polluted water is forced by mains water pressure against a semi-permeable membrane. Purified water molecules easily pass through the membrane while pollutants, typically being larger than the pores ( .0005 of a micron in size ), cannot pass through and are washed away. 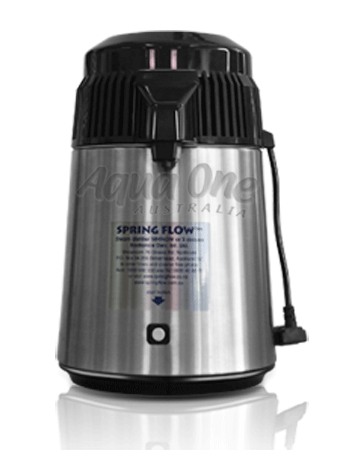 The AQUA ONE ARO5000 drinking water purifier represents the very latest in design and ultimately has become the standard for the drinking water industry. The AQUA ONE ARO5000 model remains unequalled in quality, reliability and overall performance. Years of engineering experience, field-testing and continued design refinement combines to make the AQUA ONE ARO5000 the best in its class. For Membrane Protection A special high-grade carbon cartridge pre-filter is added to protect the TFC Membrane from chlorine degradation. Specially designed to remove – pesticides and other organic pollutants eg chlorine, THM, TCE etc. Contains special acid washed, dedusted carbon with excellent absorbent qualities. Screens out the most minute micro particles. Pore size less than .0005 micron (1 micron = one thousand of a Millimetre)/ Effectively repels: heavy metal complexes including aluminium, lead, mercury etc, micro-organisms and colloidal matter. Virtually eliminates mineral ions including fluorides and sodium. Membrane has remarkable affinity for oxygen producing sparkling oxygenated water. Specially designed to remove residual toxic chemicals - pesticides and other organic pollutants eg chlorine, chloramines, THM TCE etc contains special carbon excellent absorbent capabilities Enables prolonged contact time of 12-15 minutes for maximum adsorption. Provides final polish resulting in superb tasting water. Acts as final check against any organic impurities. 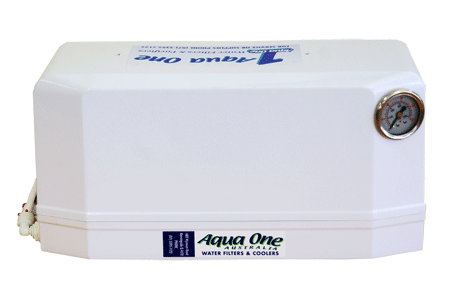 Aqua One Australia stocks a whole range of Sprite High-Output Shower Filter. Sprite Industries are the innovators of shower filters and are known to be the world's finest, enabling everybody to enjoy chlorine free showers the world over. Chlorine is universally used to chemically disinfect water. Chlorine is added to your water to destroy germs, bacteria and living organisms. You are also a living organism, and your body is affected by chlorine internally as well as externally. Inhalation and skin absorption of chloroform and chlorine by-products are greatest in the shower, where these gases are vaporised. You may be surprised to learn that your skin is your body's largest organ. You may also be surprised to learn that your skin absorbs chlorine very easily. 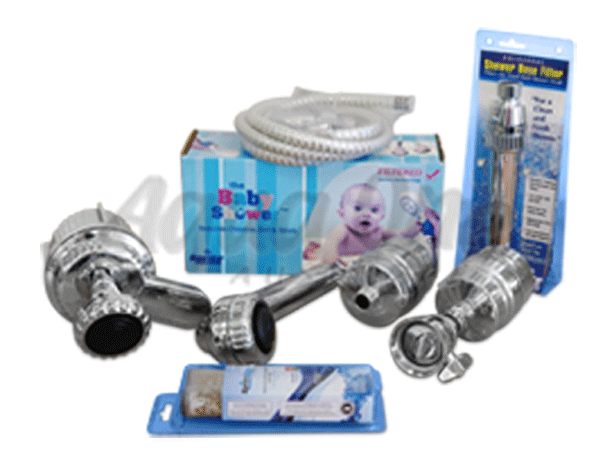 Given the fact that water passing through your shower is packed with chlorine, it then becomes obvious that a Shower Filter can have many health benefits for you and your family. 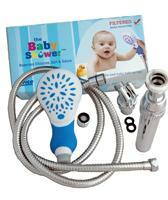 Simply screw on this shower filter, and experience the luxury of chemical free showers. Plus, this unit will save you many dollars off your water & energy bills. The filter simply attaches to existing shower fittings, ensuring that toxic by-products caused by chlorine are removed from your shower water. The Sprite Shower Filter makes hair softer and is great for people who suffer from dandruff, dry, sensitive skin or allergies. We stock Australia's largest range of replacement cartridges and filters. 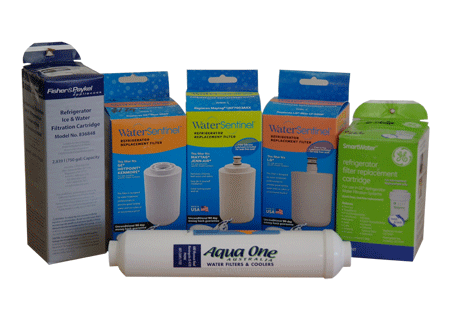 Call our customer service centre with your make and model of water filter, and we'll do our best to find you a suitable, cost effective replacement cartridge or filter at a competitive price. The RO-4000 Reverse Osmosis System connects directly to the tap faucet - no under sink plumbing is required. It has been made using high quality components and filters, and is fully portable. 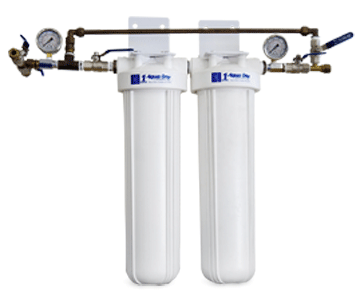 This unit offers an efficient four-stage filtration process. It has been fully factory tested, and comes with a full 5 year warranty (excludes filters). Stage 1 - Sediment / pre-filter. Dust, Rust, Sludge - Particle Removal. Stage 2 - Granular Activated Carbon (GAC) Filter. Chlorine Removal - Membrane Protection. Stage 3 - Ultrafine TFC RO Membrane (300 Litres Per Day*) - Micro particles Removed, 0.0005 Microns. Stage 4 - Carbon Polishing Post Filter. Final Polish - Superb Tasting Water. 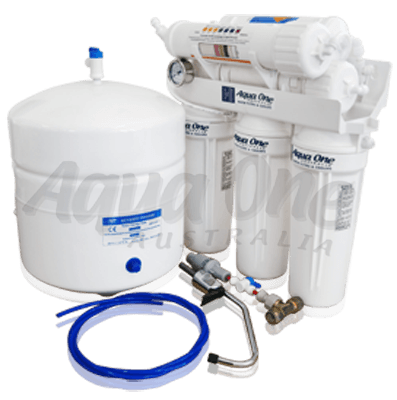 The RO-4000 Reverse Osmosis System has proven to be extremely reliable and effective, and can be fitted simply and quickly to all standard tap faucets. Brisbane Region Service Areas: Acacia Ridge | Albany Creek | Albion | Alderley | Alexandra Hills | Algester | Amberley | Annerley | Anstead | Arana Hills | Archerfield | Ascot | Ashgrove | Aspley | Auchenflower | Bald Hills | Balmoral | Banyo | Bardon | Beachmere | Bellbird Park | Bellbowrie | Belmont | Birkdale | Blackstone | Boondall | Booval | Bowen Hills | Bracken Ridge | Bray Park | Breakfast Creek | Brendale | Bridgeman Downs | Brighton | Brisbane | Brisbane Airport | Brookfield | Brookside | Browns Plains | Bulimba | Bundamba | Buranda | Burbank | Burpengary | Burwood Heights | Calamvale | Camp Hill | Cannon Hill | Capalaba | Carina | Carina Heights | Carindale | Carole Park | Carseldine | Cedar Creek | Chambers Flat | Chandler | Chapel Hill | Chelmer | Chermside | Chermside West | Clayfield | Cleveland | Coopers Plains | Coorparoo | Corinda | Crestmead | Daisy Hill | Darra | Dayboro | Deagon | Doolandella | Doomben | Dorrington | Drewvale | Durack | Dutton Park | Eagle Farm | Eagle Junction | East Brisbane | Eatons Hill | Eight Mile Plains | Enoggera | Everton Hills | Everton Park | Fairfield | Ferny Grove | Fig Tree Pocket | Forest Lake | Fortitude Valley | Fruit Grove | Gailes | Gaythorne | Geebung | Goodna | Gordon Park | Graceville | Grange | Greenbank | Greenslopes | Gumdale | Hamilton | Hawthorne | Heathwood | Hemmant | Hendra | Herston | Highgate Hill | Hill End | Holland Park | Inala | Indooroopilly | Ipswich | Jamboree Heights | Jindalee | Kalinga | Kallangur | Kangaroo Point | Karana Downs | Kedron | Kelvin Grove | Kenmore | Kenmore Hills | Keperra | Kingston | Kuraby | Lawnton | Loganholme | Lota | Lutwyche | Lytton | Macgregor | Mackenzie | Mango Hill | Manly | Mansfield | Marsden | Middle Park | Milton | Mitchelton | Moggill | Moorooka | Morningside | Mount Crosby | Mt Gravatt | Mt Ommaney | Murarrie | Narangba | New Farm | Newmarket | Newstead | Norman Park | Northgate | Nudgee | Nundah | Ormiston | Oxley | Paddington | Park Ridge | Petrie | Pinkenba | Pullenvale | Raby Bay | Raceview | Ransome | Red Hill | Redland Bay | Richlands | Riverhills | Riverview | Robertson | Rochedale | Rocklea | Rosalie | Runcorn | Salisbury | Sandgate | Seventeen Mile Rocks | Shailer Park | Sheldon | Sherwood | Shorncliffe | Sinnamon Park | Slacks Creek | South Bank | South Brisbane | Spring Hill | Springwood | St Lucia | Stafford | Stones Corner | Strathpine | Sunnybank | Taringa | Tarragindi | The Gap | Thorneside | Thornlands | Tingalpa | Toombul | Toowong | Underwood | Victoria Point | Virginia | Wacol | Wakerley | Warner | Wavell Heights | Wellington Point | West End | Willawong | Wilston | Windsor | Wishart | Woodridge | Woolloongabba | Wooloowin | Wynnum | Wynnum Central | Wynnum North | Yeerongpilly | Yeronga | Zillmere. Gold Coast Region Service Areas:Biggera Waters | Broadbeach | Burleigh Heads | Coolangatta | Logan Village | Main Beach | Mermaid Beach | Ormeau | Robina | Sanctuary Cove | Sovereign Islands | Surfers Paradise | Tallebudgera | Tugun | Varsity Lakes. Sunshine Coast Region Service Areas: Aroona | Bli Bli | Boreen | Caloundra West | Cooroy Mountain | Cotton Tree | Currimundi | Dicky Beach | Doonan | Golden Beach | Kings Beach | Kuluin | Kunda Park | Maroochy River | Mary Valley | Minyama | Moffat Beach | Mountain Creek | Noosa Sound | Pelican Waters | Peregian Beach South | Rosemount | Shelly Beach | Sunrise Beach | Sunshine Beach | Tanawha | Tewantin | Warana Beach | Wurtulla. Toowoomba Region Service Areas: Roma | Kingsthorpe | Toowoomba | Surat.